Born and raised in the Boland in the town Worcester; Shimmy Isaacs matriculated at age 17 and set her sights on the Mother City of Cape Town to pursue her need and purpose in the entertainment industry of writing and acting. With financial difficulties she encountered to further her acting studies, Shimmy started in 2001 as a wardrobe assistant for various Local South African Magazine Stylists. In 2003 Shimmy Isaacs is awarded a full scholarship from AFDA (African Film, Television and Live Performance University) where she was rewarded various accolades for performance in film and stage. Shimmy obtained a Honors Degree in Screenwriting and Acting, from AFDA (African Film, Television and Live Performance University). She obtains an International Certificate from acting school BLACK NEXXUS, NEW YORK, where she specialized in the Susan Batson Technique for film acting “THE NEED”. In 2006 she became the youngest appointed Lecturer at AFDA Acting Department specializing in Physical Theatre and Human Behavior. In 2008 she becomes a full time freelance actress, writer, producer and comedian . In 2010 she produced her first One Woman Physical Theatre Comedy “Allie Pad Funny Worcester” directed by Rob van Vuuren at the Baxter Theatre Studio. “Allie Pad funny Worcester” earns Shimmy Isaacs the best Play and Act in a Solo performance. In 2011 she joins forces with some of Cape Town’s leading ladies, Marianne Thamm, Anthea Thompson, and Anne Hirsch in the Production “Cracks in the City”. In 2012 Shimmy creates and produces two time national award winning production “HOWZIT MY BRA” which earned her the KKNK OUDSHOORN ART FESTIVAL and the KYKNET FIESTA AWARD for best actress in solo performance and best new comer for script. Showbiz Reports ranked Shimmy the 7th funniest comedian and actress in South Africa’s top ten comedians of 2011. In 2012 Shimmy performs at the Royal Carre Theatre Amsterdam where she hosted the annual South African Heritage day Celebrations Concert. 2013 November Shimmy stars in Hollywood Warner Brothers movie “Sophia Grace and Rosie’s Royal Adventure” working along renowned film Director Brian Levant. 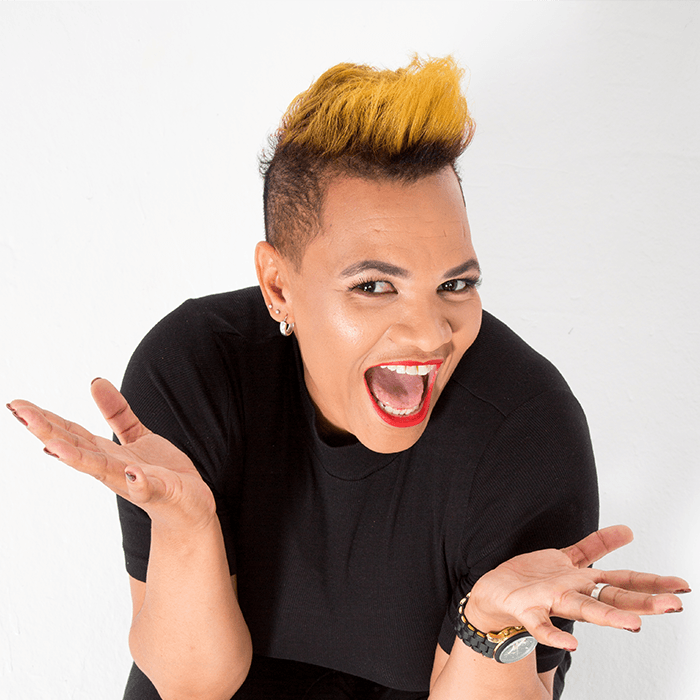 Shimmy Isaacs has performed and work alongside South Africans beloved top Comedians, Mark Lottering, Kurt Schoonraadt, Tumi Morake, David Kau, Loyiso Gola, Mark Banks, and many more. In 2013 Shimmy Isaacs returns to AFDA University where she is currently obtaining a Master’s Degree in Film Producing. From Small town, to Big City to corner stages to small screens and big screens Shimmy Isaacs can be seen at Cape Town’s various Stand-up Comedy Venues along with theatre productions following.